Motorola today announced that the V810 will start shipping from US Cellular this September. 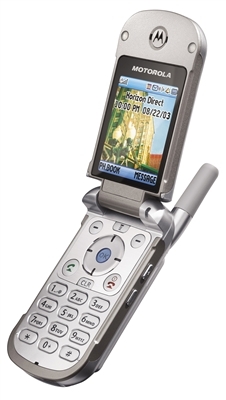 While this will be the North American launch of the phone, it was originally announced back in March 2003. Rumor has it that Verizon Wireless may carry the V810 as well. Here's a quick feature run-down: * CDMA * VGA camera with flash * 128x160 pixel 260,000 color TFT main display; OLED outer display * CDMA 1X high-speed data * BREW Expect to pay $150 to $200 with a two-year contract. Two images of the Motorola V810 follow after the jump.